. @pmharper A one-on-one debate? Any time. Any place. @M_Ignatieff @pmharper I volunteer to moderate. We further propose that the debate be held here in our hometown of Winnipeg, in the middle of the country. Open debate of public policy is what The Great Canadian Talk Show practiced for 4 years. 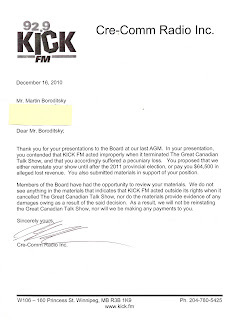 I have been a long-time supporter of Marty Gold and The Great Canadian Talk Show on Kick-FM at RRC. I was extremely disappointed when his show was taken off of the air. I was even more disgusted with the deceitful and illegal way it was done. Those responsible not only harmed his reputation, but also his means of income. I am a RRC graduate from 2007 and I am absolutely appalled that something like this could even happen from the college that I went to. It's definitely not the ethics that was instilled to us students when I attended. I am under the impression that there is an investigation into this matter. I would like to insist that there be a transparent and proper investigation. Would you be able to provide me any details on how this investigation will be proceeding? Any information would be extremely helpful. I feel that as a taxpayer who funds the college, I have a right to know. The Code of Ethics has been violated several times over by many top officials and they must be held accountable for what they have done to the community, the volunteers of Kick-FM, the College, and the radio station. I'm so sick of all of these ridiculous cover-ups, lies, and excuses and it's time that the College takes responsibility. I'm hoping that you of all people will do the right thing here. I've already asked many of those involved in this scam to just admit their mistakes, apologize, and bring Marty back to the radio station and reinstate his talk-show. Unfortunately, I have not heard one single response from them and I'm just praying that there is somewhere there who has the values and morals that I was taught as a student at RRC. Wow I just read all of these posts (and even with the deleted posts it was quite the interaction). I thought I would post my opinion. Keep in mind I have zero connection to any radio station, literary roles, political groups or any public role, I am just a listener. I listened to Marty Gold's show every day on my drive home. I am the farthest thing from a "right winger" and my views were often different from what Mr. Gold discussed. However , I loved that there was a show that was on at a consistent time that tackled the hot topics of our city. I felt like I had a better understanding on what was going on at city hall and I feel that nothing on the radio even comes close to discussing these topics. I was entertained by Mr. Gold's crescendos when he hit a topic he was passionate about (my 2 year old daughter called him the "angry man") and even if I didn't agree with a point of view, I agreed with someone who was passionate about exposing the truth. I am so disappointed that there is not a consistent show on that station now and I honestly feel like my brain cells are dying with some of the drivel I hear now (on Musings on Politics the host said that people who have their kids in Daycare are lazy parents - this coming from someone who was basing his opinion on the fact his Mum stayed home when he was young and he has no children himself). Although I can appreciate the student programming I feel like some of these shows are trying to be like Mr.Gold's show but lack the political knowledge or life experience to back their points. I would love for this show to return to the air. This coming from a Liberal, Vegetarian, Working Mum and University Graduate. I've tried listening to "Cloutier" but in the 5 mins/hour that CJOB doesn't play commercials, he seems to be trying to "out-CBC" CBC; Adler is a rhetorician & not a smart one. CBC has fewer commercials (advertising their programs & anything unlikely to make a profit) but their news is so repetitive & outside my frame of reference, I listen sparingly for news. Anna Maria Tremonti whom I catch infreqently, seems one-of-the-few who knows how to interview. So ... assuming my tastes in talk-radio are not unique in this city (wouldn't be surprised if they are), why don't you get back on the air? There must be a commercial station in this city who could use an audience-boost, "especially" with at least one election coming this year. This cover-up is worse than anyone imagined. You should do a poll on who forged the letter on photocopied Kick stationary about a decision being made to reject your appeal when there hadn't been a vote yet. And these people have the nerve to say they are suitable to educate student journalists ! "However, allowing 'outsiders' will leave us open to criticism and we may have to hang our hats on the 4-6 timeslot thing." The problem for students with the 4-6 (or at least 4-5) is that classes generally end at 4, 4:30, or 5, with some, such as Live At Five ending after 6pm. Not to mention special assignments. I don't care if Graham Thompson got his MBA from Scotland on-line, What I do care about is that he is in a position where he is supposed to be a model citizen and he never once thought to say to Cathy Rushton, I am not comfortable participating in character assasination etc. He never flinched, he said he felt a bit stupid at one point and at another said it was kind of fun. Certainly an insight into the model citizens in Winnipeg, the Margo Goodhands, Bob Cox'es, Stephanie Forsyths, Cathy Rushton (she is king pin in this story) not to mention Graham Thompson and David Weibe. Corruption in small places. Moral Erosion. To contact us with your comments or for more information email martygoldlive@gmail.com. And on Friday April 1st, a special feature ! Longtime Kick-FM host Ken Atamanchuk has filed a detailed official complaint with the non-profit that operates the station on the Red River College campus, after discovering the shadowy "Executive Committee" that has taken control of the Board in the last 6 months does not exist in the Bylaws and has no legal authority. The ficticious "Committee" is composed of the officers of Cre-Comm Inc., and includes 2 commercial radio executives, and RRC representatives Larry Partap and College legal beagle Robert Buisson, who replaced the memory-challenged RRC vice-president Cathy Rushton after the Annual General Meeting in December. "This morning I asked for Whistleblower Protection when I filed a formal 8 point complaint about the officers of Cre Comm Inc with the rest of the Board. In my investigation about the "Executive Committee" handling a manufactured complaint from Premier Selinger to Red River College about my show, I was lied to by the College lawyer Rob Buisson who breached my privacy rights, and my volunteer rights to information about Kick-FM were deliberately breached by Chairman David Wiebe. Wiebe evaded my questions about "Executive Committee" actions after I discovered it has no legal power under the Bylaws or granted by the Board. I challenged him to prove otherwise and he insulted me. The station is being illegally controlled." The bogus complaint to Forsyth and immediate actions by her representatives on the Board was a mirror image of the tactics used to swiftly silence The Great Canadian Talk Show, after Marty Gold had extensively detailed how the Winnipeg Free Press failed to report on eyewitness complaints of an admission by Ross Eadie of receiving illegal civic election financing from the NDP in the fall. Despite repeated requests for cabinet press secretary Jay Branch to correct the falsified quote in his complaint about Kenny that was not found in the transcript and apologize for distorting the content of the broadcast that got under Selinger's skin, Branch has not even acknowledged his victim's concerns. The cover-up carried over to RRC, which relies on government support for their expansion plans. After Buisson refused to explain why he gave 2 different versions of how the NDP complaint had been intercepted and discussed by the "Executive Committee" rather then sent directly to station manager Rick Baverstock as required under the official complaint process, Kenny pressed Chairman David Wiebe for documentation that would prove the "Executive Committee " was ever created by a Board motion in the first place and for what purpose. In the very first test of the Feb. 22 volunteer policy, Wiebe arrogantly refused to provide any information and broke the station rules - again. In a second online posting last night, Kenny, himself an RRC graduate, provided his analysis of the implications of the "Executive Committee" having illegally acted without the approval of the full Board, which includes 3 RRC student representatives.
" When one of the "partners" of Red River College like The Winnipeg Free Press or sugar daddy Greg Selinger couldn't take the heat from Kick-FM hosts, they cried to RRC president Stephanie Forsyth with falsified complaints. Unlike former president Jeff Zabudsky who knew right from wrong, Forsyth "suggested" things to her employees on the Kick FM Board who then try to censor Kick-FM -- even when it breaks the CRTC rules -- to make the establishment she caters to happy. I believe that this is how the myth of the "Executive Committee' was invented, to allow Forsyth to hide behind it, and protect the NDP and Free Press from being exposed as wanting to silence their critics at all costs. Why did we never hear about the "Executive Committee" when Zabudsky was College president?" "Censoring the talk shows on Kick FM is a conflict of interest for the commercial radio station board members who do not represent the general community at all, but represent Sports1290, CJOB, QX104 and rural Christian radio. If they make campus programming and future radio talent less interesting and engaging to the audience, it is less attractive to potential sponsors and preserves their own advertising monopoly. But they don't care, because the radio stations don't pay a dime towards Kick-FM's operations, and they have encouraged the debt to the College grow to over $275,000 of OUR money with the community or volunteers having no say on the Board in breach of the CRTC rules. This smells like a racket." A longtime talk-radio fan, Kenny had come into the Kick-FM fold in 2007 as a producer and eventual co-host of The Great Canadian Talk Show, and scored success as a broadcaster with his breaking news about the 511 national emergency alert system rollout being stalled at risk of human life, and coverage of how unelected Premier Selinger's carrying the Olympic Torch at the invitation of the Aspers broke the rules. He was scheduled to appear on TGCTS on the day it was axed and has told members of the Facebook support groups that based on his investigation, the cancelation is now more suspicious than ever. "Everyone knew something was fishy on November 8th and now we all know why it did not make any sense. The cancellation of The Great Canadian Talk Show was illegal. The "Executive Committee" wanted to do the same to me for the NDP government until I caught them. Marty has published internal emails proving that students, alumni, sponsors, listeners and the media like the National Post were lied to by the likes of Dean of Business Graham Thomson who called his role "fun in a twisted kind of way". TGCTS was for 4 years an important part of the communities right to information and hold the mainstream media, city hall and the legislature accountable. It held politicians to account in an unparalleled fashion and broke dozens of important stories the mainstream media could not understand. It was silenced by those who have no respect for the public. The appeal process was fixed and totally controlled by the College lawyer, who did not allow the rest of the Board to see the evidence and discover for themselves, that the cancellation was illegal and a breach of the contract with Marty Gold." In his email to the Cre Comm Board, which is available via thekennyshow@live.ca, Kenny asked the 6 remaining Directors (that is, non-officers), to hold a hearing into his detailed complaints against Wiebe, Buisson, Partap, Thomson, and vice-chair Chris Stevens,and asked for Whistleblower Protection. When the hearing is held, Kenny may want to present to those non-officer Directors a copy of the following letter. They could be very surprised by it. It was sent to Marty Gold on photocopied Kick-FM letterhead dated December 16, signed with a suspiciously unreadable signature, and stated his appeal for reinstatement had been rejected. - The letter with the unreadable signature was supposedly approved by unidentified "members of the Board." - The Bylaws require all questions put to the Board of Directors, such as the presentations at the AGM, be decided by a vote of ALL Directors. Who signed the letter is a mystery. The Board was told by David Wiebe on December 9th Buisson was "handling the appeals" even though he was not a Board member and they had not voted to let him act for the Board. On Dec.14 Rushton left the Board and was replaced by the College lawyer Buisson . Two days later the letter was sent. Based on Kenny's finding, there are important questions the remaining non-implicated Directors must investigate about way the appeals process was manipulated. Remember, the Executive Committee held only 4 out of 10 votes. If compensation was agreed to, the College would have to pay. If reinstatement was agreed to, heads could have rolled on the NDC. Who signed the letter and under which authority? Gold had argued that the cancellation by the actions of the "Executive Committee" alone was not legal and Kenny backs it up with evidence from the Board chairman himself. "if there is something in the by-laws that could be interpreted as having not been complied with this week, it could add fuel to the "Bring Back Marty Gold" Fire." In concluding his statement to the online community of Kick-FM listeners, Kenny pointed to the Whistleblower aspect of his blowing the lid off the "Executive Committee" scam - the taxpayers of Manitoba underwrite Red River College, whose executives then funnel money to the station as a bottomless pit with no regard for the community as stakeholders. He told supporters to demand the College take responsibility. "We as taxpayers fund the College and the Code of Ethics has been violated by many top officials. They must all be held accountable for what they have done to our community and to the volunteers of Kick FM and the reputation of our college and radio station. Liars have no place in campus radio or as College employees and the cover-up by College officials must stop. Insist on a proper and transparent investigation and that she respond to your inquiry with details of how it will proceed." Coming up- in retrospect, internal documents from 2 Board members indisputably confirm the "Executive Committee" scam as described by Kenny; and Kick-FM listens react to Kenny blowing the whistle on his alma mate. The first week without The Great Canadian Talk Show was almost done and Cathy Rushton was already looking forward to holiday cheer. 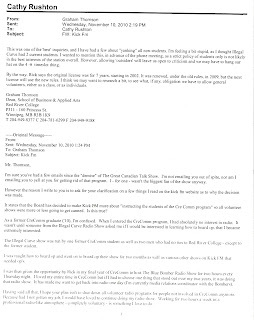 The Red River College vice-president and her fellow employees, acting on the 'suggestion' from their boss RRC president Stephanie Forsyth to silence the popular show after being pressured by Winnipeg Free Press editor Margo Goodhand, had connived a way to sidestep the Board of the non-profit that ran Kick-FM on the Princess St. campus. The "Executive Committee" of Cre Comm Inc., which included Rushton and Creative Arts Department Chair Larry Partap, had "held a meeting" on November 2nd and "made a decision" to "refocus the station" and give the boot to all non-student hosts to make sure to be rid of Marty Gold. It was Friday and Cathy Rushton wanted to wrap up the week of concocting cover-ups. 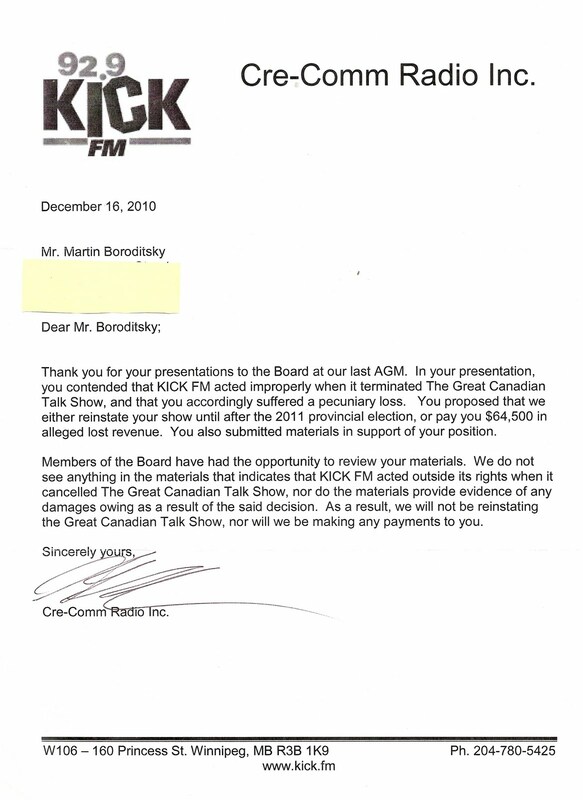 Two days earlier, Dean of Business Graham Thomson, who was the first member of Kick-FM's Board to learn of Goodhands' (false) complaint and immediately offered to find a way to kill the show "without too much trouble", had been blindsided. 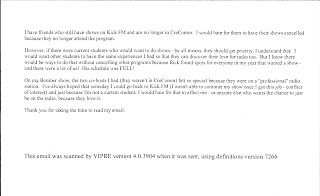 A recent RRC graduate and ex-Kick FM host pointed out that no existing shows had needed to be canceled to make time for student programming in the past, and that the new policy made no sense. "Feeling a bit stupid", Thomson had forwarded the email to Rushton to let her know that "a strict policy of students only is not likely in the best interests of the station" but that "allowing 'outsiders' will leave us open to criticism and we may have to hang out hats on the 4-6 timeslot thing." Now, finally, the weekend beckoned -- if only those pesky listeners would stop blindsiding Thomson with their damn logic. One of the many bloggers who had been given a voice during the civic election and contributed to the show, John Dobbin, was also seeing through the cover-up story, and he wrote a story about it at 4.03 PM on Friday, November 12th. "I spoke to Dean of Students Graham Thomson this afternoon for an explanation about the cancellation of The Great Canadian Talk Show. In short, I said that the station seemed to have a good student representation on the show and I asked whether the show should have been given an opportunity to demonstrate that. I put forward that there was a few shows on Kick FM that were run and operated by volunteers and asked if they were all in trouble. Thomson indicated he was taking notes from all the people who called and he explained what the radio licence called for." "I pressed him on that and said I wasn't sure that the show didn't meet a lot of the requirements of student participation and could have done more if the college had given the opportunity. To close the conversation, Thomson indicated that he thought Marty Gold would have the opportunity to re-apply for a radio slot. In other words, it looks as if an appeal might be happening. I have not heard confirmation of this but it could mean that the show with some tweaks could be given the opportunity for a come back. I await further information." When Rushton got the Google Alert about 'Marty Gold' and saw the hyperlink of Dobbin's blog post that included "re-apply for a radio slot", she blackberry'd a terse one-liner to Thomson at 6.25 PM. "Please tell me that you didn't say that Marty could re-apply." The next afternoon, Thomson finally came up with a reply to calm his agitated boss-lady. He had no choice but to lie to Dobbin about the appeal process because, after all, he had already lied to the students and public about the real reason for the show being canceled - and he admitted it had nothing to do with the "timeslot thing" either. since we have publicly said that we have no issue with Marty per se, I didn't want to say there's no way we'd have him back." 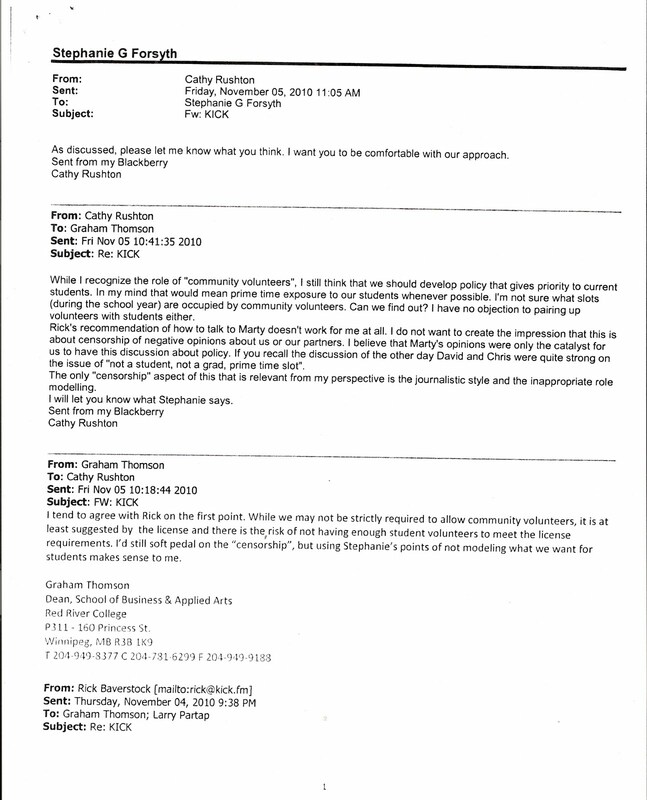 So the lies concocted by Red River College are exposed once and for all, by Graham Thomson. * TGCTS being canned had nothing to do with hearing more RRC students on Kick-FM. * It had nothing to do with the prime time slot being required for students' shows. * And the Dean of Business, Graham Thomson, admitted the fix was in to sink any appeal by Marty Gold and the listening community at the Annual General Meeting on December 9th to return to TGCTS to the Kick-FM schedule. "There's no way we'd have him back". Rushton, an expert in rationalizing the morality and damaging effects of College officials making false and misleading statements (in her case, about Sam Katz and Vic Toews "complaining about" TGCTS), once again found a way to make herself and her henchman feel good. It must have been Dobbin's fault for not getting it. 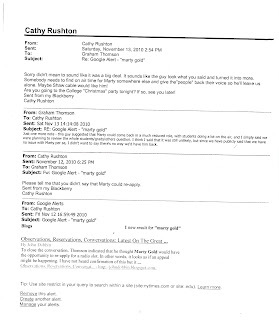 And Rushton again shared with Thomson her dismissive contempt for the general community, as she had for the Winnipeg Police Association and others who supported the radio show she made sure was permanently censored for the "journalistic style and inappropriate role modeling". "It sounds like the guy took what you said and turned it into more. Somebody needs to find on air time for Marty somewhere else and give the "people" back their voice so he'll leave us alone. Maybe Shaw cable would like him ! " Her faith restored in the superiority of Red River College's management to the peons who pay their salaries like John Dobbin, and having shed herself of any obligation to share the airwaves with nasty bloggers and the rest of the great unwashed that has unknowingly subsidized the station she was treasurer of to the tune of $275,000, Cathy Rushton turned her attention to more important concerns. "Are you going to the College "Christmas" party tonight? if so, see you later!" Coming up: Freedom of Information documents reveal: the "Executive Committee" deception not only duped Kick-FM Directors, but unfortunately for them, one of their own members; how business is done, Graham Thomson - style; the wit and wisdom of Kick-FM chairman David Wiebe. - TGCTS alum update: Shannah-Lee, Shecky and Young Josh continue to enjoy success as professional broadcasters; Stacia hired by Wpg. Chamber of Commerce to organize social media; Caed hired by rural radio station. (Left) A picture of jet-lagged Red River College president Stephanie Forsyth forlornly waiting for her luggage at the airport on Sunday March 6th, after returning to Winnipeg from Vancouver. Was she contemplating the rumoured-and-since-confirmed retirement of respected journalism instructor Steve Vogelsang from the Creative Communications program ? Or the responses to the advertised job search for a new executive assistant to replace the departing Deb Pokrant, now under scrutiny for allegedly breaching the privacy of Kick-FM volunteer host Spirited Kenny by circulating a bogus complaint from Premier Selinger's NDP government within the College ? Yesterday, internal emails were published that proved Stephanie Forsyth's agents on the Kick-FM Board knew the 'new policy' used to justify TGCTS being discarded from the airwaves was easily exposed within 48 hours by a former Kick-FM volunteer as nonsense. 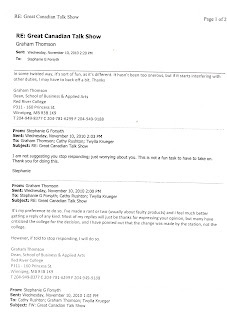 The only remaining excuse of the "Executive Committee" to "hang our hat on" was to falsely claim the TGCTS prime time slot was required to accommodate projected new student programming, as part of the "this has to be kept confidential" cover-up of censorship urged by Free Press editor Margo Goodhand in her emails to Forsyth containing a false complaint about Marty Gold. A graduate of Red River College saw the blog post and followed up on his November email with even more for questions for Stephanie Forsyth and RRC Dean of Business and Kick-FM Board member, Graham Thomson. I just wanted to let you both know that even though it's been a while since you illegally and deceitfully decided to cancel Marty Gold's radio show, I (along with many more) have not forgotten. I am still keeping up to date with the unbelievable details as to how you dishonestly reached your decision and canceled the enormously popular and informative show. I thought after having some time to think about how your hurtful actions affected someone's livelihood, that you'd come to the realization to do the right thing ... apologize to Marty and bring back his show. Clearly that hasn't happened. Instead of apologies we hear excuses. Is that how you teach people to get ahead in life? That if they don't agree with someone they should make up lies about them? I went to Red River and I was proud of Red River. It was a school that I believed in and a school that I trusted to be honourable to everyone. You are the leaders and yet I see no honour in your actions. Is that how you'd want your own children to learn?! Just stop with the lies about there being complaints about The Great Canadian Talk Show. Face it ... there wasn't any, was there? But please, if there actually is, could you please tell me or show me these complaints (in all seriousness)? Show me where Mayor Sam Katz complained. Show me where Vic Toews complained. Show me where our Police Association complained. Please, just prove me wrong. I'm so sick of people like you in power abusing your authority. The only thing you've done is prove that Marty was right all along and everything he spoke of on his talk show was correct. I feel sorry for the current students of RRC who are being led by you two. You have to realize that your decision didn't just affect yourselves and some of your friends. You damaged someone's reputation and career. It's time to stop being selfish and do what is right. Look inside yourself and don't be afraid to swallow your pride. Life is way too short. It's never too late to say your sorry. p.s. Good job with the replacement show(s) during that 4-6 p.m. time slot. You have students calling each other retards and acting like 6th graders. That's not nearly as offensive. 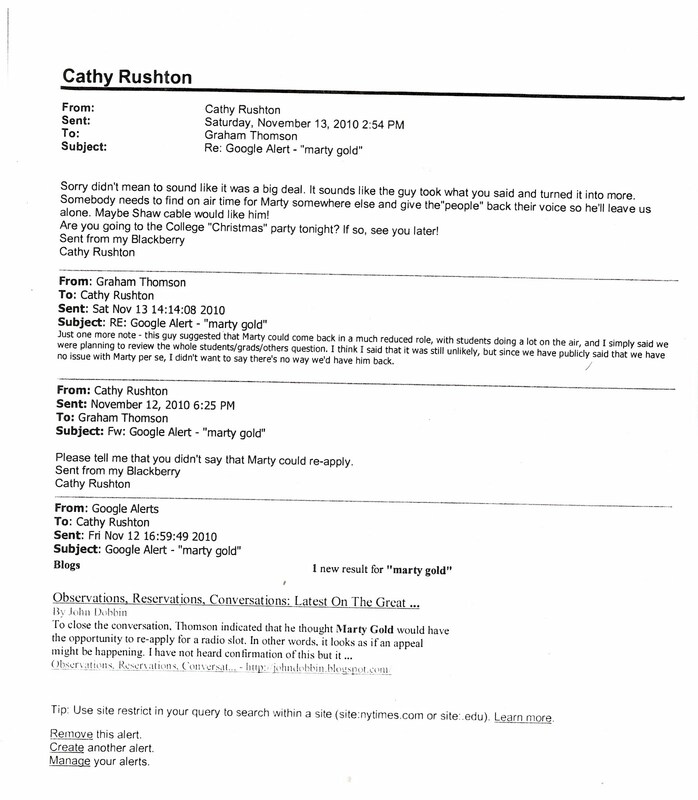 Here's a little FYI, it's a link where you can read just how controversial the college has been about Marty Gold's firing (http://tgcts.blogspot.com/2011/03/thomson-told-rushton-only-one-excuse.html) ... careful, though, you may feel embarrassed. On Monday, November 8th, when The Great Canadian Talk Show was canceled on 35 minutes notice by Red River College officials, they thought they had all the angles covered. - Winnipeg Free Press editor Margo Goodhand had bypassed formal processes to pressure new president Stephanie Forsyth (with a false complaint) to silence The Great Canadian Talk Show on Kick-FM, the non-profit station that owed the College a huge accumulated financial debt. - A policy "decision" was purported to have been made at a November 2nd "Executive Committee meeting" that would end all programming by non - Red River students on the station, in circumvention of a full Board vote of approval required under the Bylaws. That was the only way Forsyth's agents could ensure that Marty Gold would not be able to defend against the Free Press intimidation tactic and be stopped from broadcasts holding the mainstream media ("partners" of Red River College) and "people whose opinions we care about" (ie the government) to account. - Forsyth's College officials solidified control of the non-profit Board by enlisting support from radio industry reps acting as fellow "Executive Committee" members of Cre-Comm Inc., who viewed the popularity of the show within the community as competing with their own stations for listeners and who pretended they were above conflict-of-interest guidelines. - A Forsyth-approved statement was ordered onto the station website with excuses concocted to cover-up for the real reasons for the cancellation - censorship by Red River College of the freedom of speech exercised by the community on public airwaves. 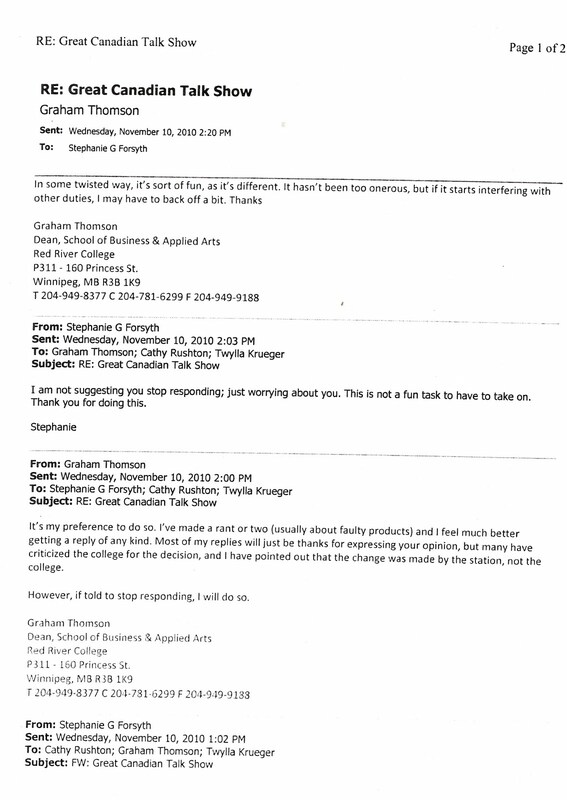 But in less than 48 hours, an email from a former Kick-FM host forced Dean of Business and Kick-FM Board member Graham Thomson to think hard about what to tell fellow hatchet-bearer, RRC vice-president Cathy Rushton, when he realized a 'new policy' of 'students only' was not believable even to people who were not necessarily fans of the show. In fact, one who had learned at the station explained how it didn't make sense to him. "... the reason I write you is to ask for your clarification on a few things I read on the kick fm website as to why the decision was made. 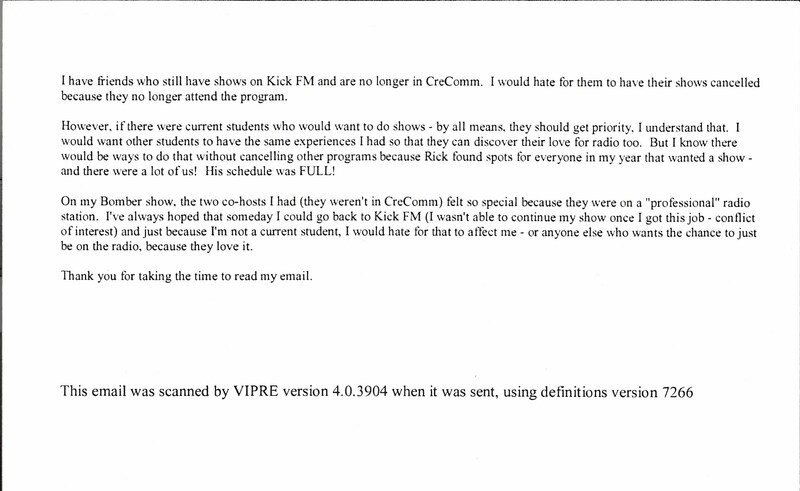 It states that the Board has decided to make Kick FM more about "instructing the students of the CreComm program" so all volunteer shows were more or less going to get canned. Is this true? As a former CreComm graduate ('10) I'm confused." " I hope your plan isn't t shut down all volunteer radio programs for people not involved in Cre-Comm anymore ... I have friends who still have shows on Kick-FM (and) I would hate for them to have their shows cancelled because they no longer attend the program." Then, inadvertently, the former host exposed the flimsy excuse of the official statement that the prime-time spot occupied by TGCTS was needed for current students. "However, if there were current students who would want to do shows- by all means, they should get priority, I understand that... But I know there would be ways to do that without cancelling other programs because Rick found spots for everyone in my year that wanted a show- and there were a lot of us ! His schedule was FULL!" Thomson forwarded the email to Rushton and cautioned her that the cover-up was being whittled down to a flimsy and demonstrably false excuse. "This was one of the 'best' inquiries, and I have had a few about "yanking" all non-students. I'm feeling a bit stupid, as I thought Illegal Curve had 2 current students. I wanted to mention this, in advance of the phone meeting, as a strict policy of students only is not likely in the best interests of the station overall. However, allowing 'outsiders' will leave us open to criticism and we may have to hang our hats on the 4-6 timeslot thing. " That's what is called "welcoming volunteers" at every other campus station in the country. To Red River College, people from the community are "outsiders". "HANG OUR HATS ON THE 4-6 TIMESLOT THING." The "Executive Committee" had to "hang their hats" on requiring the timeslot -- but it wasn't actually required for the students. It's now obvious why Graham Thomson didn't send the Nov. 10th email to station manager Rick Baverstock in November, isn't it? Baverstock has said he would have pointed the Board to it at the Annual General Meeting on December 9th as proof that TGCTS did not have to be canceled to make room for new student radio programs, as the email was evidence he had previously fit them into the schedule even "when there were a lot". Graham Thomson insisted to outraged listeners (and to the National Post) that the Winnipeg Free Press had nothing to do with TGCTS being silenced, that there was a 'new policy' for programming, and that prime time was needed for new student programs (even though he also said it didn't matter to the station if anyone was listening or not) and that the time slot was not targeted. Well, considering only one show was axed under the 'new policy', the policy was changed within 48 hours, and that the station of one of the Directors of Kick-FM involved in the cancellation is now in the prime time business with the Winnipeg Free Press, the Dean of Business Graham "I'm feeling a bit stupid" Thomson is now 0 for 3. Still to come: The 'twisted fun' Thomson told his boss he was having with the inquiries of the concerned public; their dismissive comments about the listeners and bloggers who happen to pay their wages through their taxes; and the bogus "appeal process" exposed. Recently, many people it seems have become increasingly interested in the Dean of Business and Applied Arts for Red River College, and Cre-Comm Inc. Board member, Graham Thomson. After all, he was the first person associated with Kick-FM who found out that College president Stephanie Forsyth got a "complaint" from Winnipeg Free Press editor Margo Goodhand about Marty Gold and "she has her lawyer working on it". 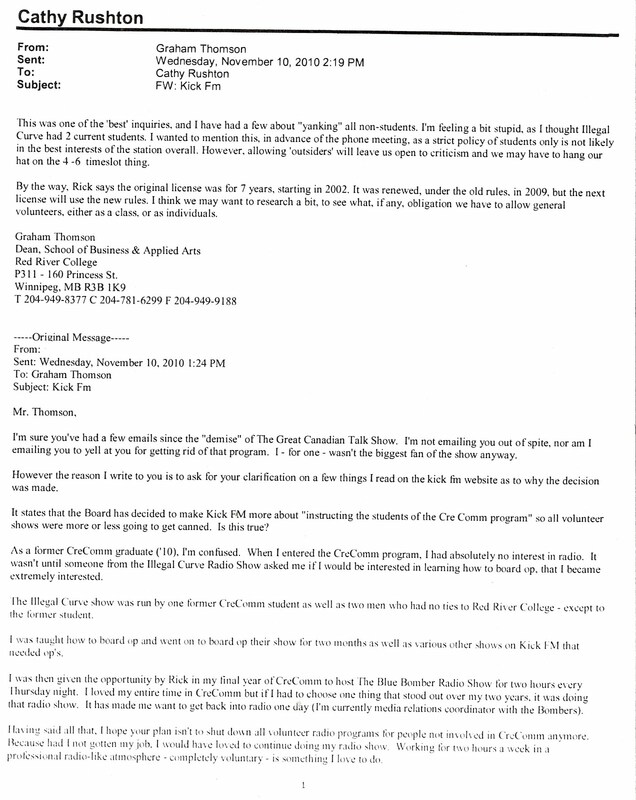 But instead of advising executive assistant Deb Pokrant that the official College policy (as he well knew) was that anyone complaining to the College about the station it funds had to file their complaint, in writing, with station manager Rick Baverstock to prevent intimidation, Thomson had his own policy. Please his new boss at all costs. "I don't think the College has the technical ability to remove him from the air ... this could be done without too much trouble, either through a chat with Rick, or more formally, through a board directive", he told Pokrant on October 22. Two weeks later, after contorting himself to find a way to exempt the Free Press radio show from the plan to ban all station volunteers -- designed to make sure Marty Gold was silenced -- Thomson emailed RRC vice-president Cathy Rushton, who represented Forsyth on the radio station Board. Thomson suggested the College cover-up the role of Forsyth and the Free Press and "soft pedal on the censorship". "Mr. Thomson said the vice-president was present at the Nov. 2 executive board meeting of Cre-Comm Radio Inc. — the non-profit corporation that manages the station — where four voting board members unanimously decided to cancel Mr. Gold’s show. Also brought under scrutiny was his tall tale to the Jewish Post that the cancelation idea was from two commercial radio station executives: Cre-Comm chairman David Wiebe (soon to be retired as Vice-president of Elmer Hildebrand's Golden West Radio chain), and Vice-Chair Chris Stevens of SportsTalk CFRW, (who is now in business with the Free Press with their own drive-home talk show). Those damaging emails, and the serious inconsistencies in his other public statements and emails to outraged supporters, have highlighted concerns with Winnipeggers about the censorship of the community and the conduct of the not-for-profit radio licence and it's mouthpiece, Graham Thomson. In December, our senior producer "Captain Audio" had his own dealings with Graham Thomson. He had made a presentation on December 9th to the Annual General Meeting of Cre-Comm Inc about the sudden cancelation of TGCTS and resulting financial implications. When asked, Thomson refused to answer basic questions about how his presentation was subsequently handled and by whom. In the mind of our senior producer, a veteran newsman, this odd behavior brought into question the qualifications of Graham Thomson. But when he went to learn more, Captain Audio found a problem. Unlike the Asper School of Business at the University of Manitoba, where biographical information is online about everyone from Executive in Residence Reg Alcock to Accounting and Finance associate professor Stephen Zhang, the RRC website doesn't even list what degree Thomson has, let alone a single detail of his background. "The information you are requesting about Mr. Thomson is personal information and as such you will have to request it from Mr. Thomson himself. It would be up to him ." Given his unwillingness to respond to the simplest of questions about how the Kick-FM Board made "decisions", it seemed ol' Graham had his hands full already. But once the task of separating all the other Graham Thomsons in the world from the Winnipeg version is accomplished, it turns out Mr. Thomson has provided his "personal information" to a number of organizations -- who have posted it online for all to see. For starters, Thomson sits on the Advisory Board of a favorite target of TGCTS, the often subsidy-from your-Hydro-bills-dependent wind farm industry, which starts to fill in some of the gaps. "Global Wind Group Inc. (GWG) is a Winnipeg, Manitoba based Clean Technology Company"
He started 2 small businesses in the 1980’s and prior to that, held management positions in Personal and Corporate Trust at the Canada Trust Company ... Graham has held various roles at the college over a 23 year career, which started as an Entrepreneurship instructor. Graham Thomson is Dean of the School of Business and Applied Arts at Red River College. Prior to this he has had a long career in post-secondary education including as an RRC instructor, Business Administration Program Coordinator, Chair of Management and Marketing, and Chair of Creative Arts. So Thomson preceded fellow Kick-FM Board member Larry Partap as honcho of the RRC Cre-Comm courses. Before joining the faculty at RRC, Graham owned and operated two small businesses. No information has been found about those businesses. But in the latter-day, Thomson's LinkedIn states he has been President of a respected Michigan-based film accounting business and school, John Gaskin Productions since 2007; the company handled duties for the Winnipeg-lensed 2004 Richard Gere/J-Lo romantic comedy Shall We Dance. Graham currently sits on the boards of the Central Neighborhoods Development Corporation, Cre-Comm Radio Inc. (Kick FM), and FortuneCat Video Games Incubator (past-Chair). Fortune Cat was in the news awhile ago. The Winnipeg Free Press reported it was folding after a much-ballyhoo'd launch in 2006. "The studio relied on federal and provincial monies. The federal funding dried up about a year and a half ago and FitzGerald said the provincial funding was ending this year... The provincial government said in a statement Monday it provided a total of $662,954 in funding to the Fortune Cat Games Studio between 2005 and 2010." I think in the interest of taxpayers, I should forward a summary of my experience at and after Fortunecat. *My firm brought 10 times more funding to Manitoba from outside within 1 year after graduation from Fortune Cat than that we were given. We made jobs. Hurrah. Success, like all small business: sweat and tears. * As an incubatee, 90% funding was held _until_ month 8 of 9 months. Our collective requests to use funding to hire developers for the first 8 months to complete the project were refused repeatedly and inexplicably. * For 8 months, I and the other 2 intial incubatees focused on bringing in contracts for survival. These were successful, including a CNMA award-winning project. * Meetings between us and the FC board beyond the first week were non-existent. * After graduation (year 1, we're 4 years in now), several ways to make the program work were suggested, including mid 5-figure private investment from my firm. Nothing was adopted, again, inexplicably. I wish FC were a better story, but like many, my take on it is that it was ultimately veiled in distrust and bad sensibilities. Winnipeggers, we can do anything, but we need to be open to intelligent discourse. Fortune Cat is not the sum of its parts, but of its weaknesses. But what of Thomson's actual advanced studies, you ask? He holds a Bachelor of Commerce (hons) from the University of Manitoba and an MBA from the Edinburgh Business School. In the world of academia, a kind of perspective is applied by the Financial Times to such credentials. Rankings. For MBA's, the top ranked schools are the likes of London, Harvard, and Stanford. Edinburgh Business School managed to crack the top 90 - at # 89. Slightly ahead of Montreal's McGill (# 95). Being pretty busy both at work and with family, I wanted an MBA with maximum flexibility on timing. The EBS MBA fit very nicely with my schedule. While I didn’t have to use it, the ability to defer an exam is a nice feature. The 100% final exams suited me very well, again saving me time. While they can be perceived as high pressure, I found that the comprehensive exam made me work hard to have a complete understanding of all the course material. The exams were challenging, but fair. In nearly all cases, they tested on the critical, core concepts. I found the course content to be excellent, in most cases. Strategic Planning, Project Management and Influence were especially good – I found the reading to be anything but a chore. As well, even though I had taken Accounting and Economics before, the approach in those courses was very practical and added new knowledge. I especially enjoyed the humour in the Economics course. So armed with a one-year online Masters Degree from the 89th ranked business school, Graham Thomson is promoted as a bright light in the Red River College universe and a leader of advanced education and the community. Coming soon: With all that "advanced edumaction", why was Graham Thomson left "feeling a bit stupid" in the days after the cancellation of TGCTS ?